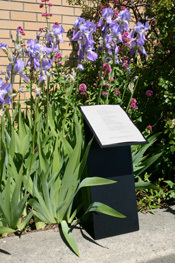 The Poetry Foundation Library in Chicago is the Midwest’s only library dedicated to poetry. Visitors to the library may browse a collection of 30,000 volumes, experience audio and video recordings in private listening booths, and view exhibits of poetry-related materials. The library is open weekdays 11:00am–4:00pm (check website for holiday closures). The Poetry Foundation has launched a new podcast series, A Change of World, an oral history of poetry in 20th-century feminism and the second-wave women’s movement. Each of the six episodes explores the cumulative sources and voices of feminism through readings by poets, interviews with critics, and short poetry documentaries. The Poetry Foundation has posted a lovely new series of short animated films for all ages. Motion Poems is a selection of contemporary poems retold from the filmmaker’s perspective, created in partnership with Motionpoems (previously mentioned here and here), an independent animation studio that brings poetry to life through film. If you’ve stopped by the Poetry Foundation website or perused a copy of Poetry magazine recently, perhaps you’ve noticed that things are looking different. Indeed. The Poetry Foundation has a new logo, developed by Pentagram. Read the story on the Pentagram site or on Creative Review. The Poetry foundation also offers an article on its new look as well as a 2012 story about Poetry magazine’s hundred year history of magazine design.